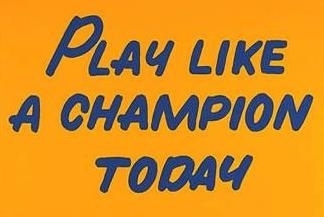 Hand-painted in blue letters on a 36″ by 48″ sign located in a stairwell between the Notre Dame locker room and the tunnel out to the football field is a sign that reads Play Like A Champion Today. Head football coach Lou Holtz asked for it to be painted and hung there so that all players would touch it on the way out to the field. It is one of the most meaningful traditions at The University of Notre Dame. It also serves as a reminder of how important it is to play like a professional. Traditions like Play Like A Champion Today are meaningful to me because I’m from South Bend, home of the Fighting Irish, and grew up around Notre Dame football. I’ve been thinking about this phrase lately, and how it pertains to what you and I do every day in our respective fields. Aren’t we called upon to play like champions every day? Just like Notre Dame football players are called upon to play like champions for their school, their team, their fans and their families, we are called upon to play like champions on behalf of our firms, companies, colleagues, clients and families. Strengthening our weaknesses….when we know we need them to help our clients. Take a moment. Picture champions you know, in any field of play, on the court or off, in the boardroom or not, part of the partnership or not, and picture what makes them a champion in your mind. Now please take another moment, and share those characteristics here with all of us. What does it mean to you to Play Like A Champion Today?